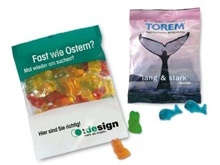 You can't miss out with our Custom Shaped Sweets - quality sweets with huge customisation capability. Have your corporate branding on the tip of a customer's tongue with flavours of Pineapple, Strawberry, Raspberry, Orange and Lemon. The style of sweet, shape and colour can be bespoke, perhaps a car shaped sweet if you are in the car industry? The packaging can be fully printed with your Company's artwork, logo and branding - on either transparent of white! Stand out from the crowd with our Custom Shaped Sweets! For a FREE QUOTE, please fill in the form regarding our Custom Shaped Sweets and we'll be able to help you.